The artist Julien Kiely has kindly reconstructed the newborn in this fantastic scene Credit: Julian Kiely. Scientists from the UK have identified the smallest and youngest specimen of Ichthyosaurus communis on record and found an additional surprise preserved in its stomach. The ichthyosaur fossil has a total length of just around 70 cm and had the remains of a prehistoric squid in its stomach. Ichthyosaurus communis was the first species of ichthyosaur, a group of sea-going reptiles, to be properly recognised by science, in 1821. The University of Manchester palaeontologist and ichthyosaur expert, Dean Lomax, said: "It is amazing to think we know what a creature that is nearly 200 million years old ate for its last meal. We found many tiny hook-like structures preserved between the ribs. These are from the arms of prehistoric squid. So, we know this animal's last meal before it died was squid. 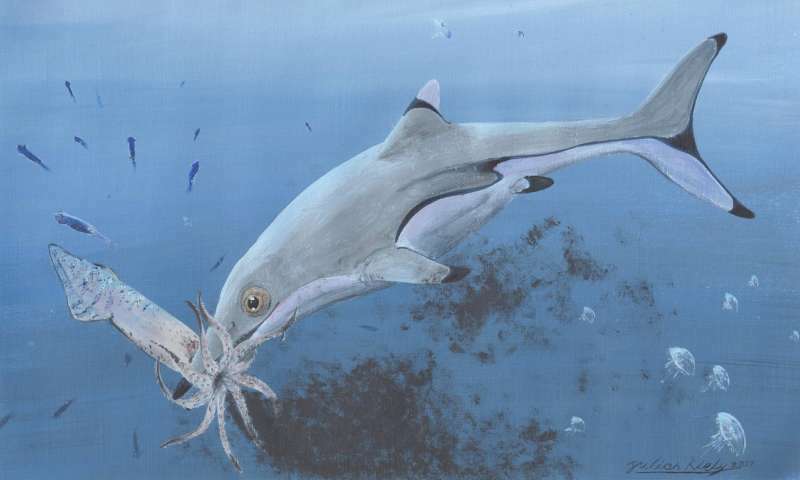 "This is interesting because a study by other researchers on a different type of ichthyosaur, called Stenopterygius, which is from a geologically younger age, found that the small - and therefore young - examples of that species fed exclusively on fish. This shows a difference in prey-preference in newborn ichthyosaurs." Many early ichthyosaur examples were found by Victorian palaeontologist, Mary Anning, along the coast at Lyme Regis, Dorset. It is one of the most common Early Jurassic fossil reptiles in the UK. The new specimen is from the collections of the Lapworth Museum of Geology, University of Birmingham. Palaeontologist Nigel Larkin, a research associate of The University of Cambridge, cleaned and studied the specimen in 2016, and recognised that it was important. The cleaning provided Dean with the opportunity to examine the fossil in detail. Dean, who recently described the largest Ichthyosaurus on record, identified this specimen as a newborn Ichthyosaurus communis, based on the arrangement of bones in the skull. He added: "There are several small Ichthyosaurus specimens known, but most are incomplete or poorly preserved. This specimen is practically complete and is exceptional. It is the first newborn Ichthyosaurus communis to be found, which is surprising considering that the species was first described almost 200 years ago." Unfortunately, no record of the specimen's location and age exists. However, with permission, Nigel removed some of the rock from around the skeleton. He passed this on to Ian Boomer (University of Birmingham) and Philip Copestake (Merlin Energy, Resources Ltd) so that they could analyse the rock for microscopic fossils. Based on the types of microfossil preserved, they were able to identify that this ichthyosaur was around 199-196 million years old, from the Early Jurassic. Nigel added, "Many historic ichthyosaur specimens in museums lack any geographic or geological details and are therefore undated. This process of looking for microfossils in their host rock might be the key to unlocking the mystery of many specimens. Thus, this will provide researchers with lots of new information that otherwise is lost. Of course, this requires some extensive research, but it is worth the effort." As part of the study, the skeleton was Micro CT-scanned and a three-dimensional digital model was created by Steve Dey of ThinkSee3D Ltd. Using medical imaging software, Steve converted the 3 sets of CT cross-sectional images (from scans of the tail, middle section and head) into a single digital 3D model of the whole animal then digitally measured key metrics as required by the science. The perfect newborn ichthyosaur is on display in the recently refurbished Lapworth Museum of Geology, University of Birmingham.